The Nome Trilogy, also known in both the United Kingdom and the United States as The Bromeliad Trilogy, is a trilogy of children's books by British writer Terry Pratchett, consisting of the books Truckers (1989), Diggers (1990) and Wings (1990). The trilogy tells the story of the Nomes, a race of tiny people from another world who now live hidden among humans. Through the books they struggle to survive in the world and, once they learn of their history from an artefact known as "The Thing", make plans to return home. Diggers and Wings are to be read as contemporaneous sequels to Truckers, as each book follows different characters through (mostly) concurrent events. The central character throughout Truckers and Wings is Masklin, while in Diggers it is mainly Grimma. Pratchett covered the idea of small people in his first novel, The Carpet People (1971/1992), about a race of tiny people even smaller than Nomes. That book is unconnected to this series. The main theme in the trilogy is the struggle of challenging society's accepted beliefs in the face of new information. This theme is recurring through the books and includes changes in the scientific establishment, political establishment, religious beliefs, accepted history and family values of the nomes. 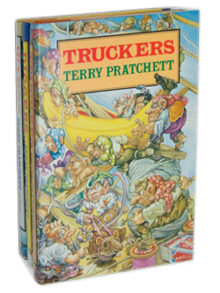 References in the books suggest that they are set in the same world as Pratchett's Johnny Maxwell novels (1992–1996), which begin with Only You Can Save Mankind. After being asked if he would write about the Nomes' return (as implied at the end of Wings), Pratchett replied, "there may be another book about the nomes." No such book had been announced as of his death. The name of the Bromeliad series refers to the fact that some species of small frogs live their entire lives inside bromeliad plants, which is a metaphor used throughout the books. Other differences include the earth-moving machine JCB called "Jekub" in the UK version but "CAT" in some US editions, John Deere (called Big John) in others. All three names refer to common generic trademarks for heavy equipment in their respective countries. Masklin, a 4-inch high Nome, lives in a grass verge by a motorway service station with his friend Grimma and the remaining elders of their once-large tribe, which has been dwindling due to food shortage and predation by foxes, while several Nomes have headed across the motorway. The other younger members of the tribe departed some time before to find a new place to live, but never returned after crossing the motorway - where they were inevitably killed by cars or lorries. Masklin, finding it increasingly difficult to find food for the group, formulates a plan to escape on a truck from the nearby service station - the final straw being when a fox runs into the path of a lorry after attacking a Nome called Mr Mert, killing them both. The Elders, led by Granny Morkie and Old Torrit, initially oppose the move but finally agree, bringing with them 'The Thing', a small black cube that has been the tribe's symbol of authority for as long as anyone can remember. The truck finally delivers them to the loading bay of Arnold Brothers department store, where they are greeted by Angalo De Haberdasheri, an 'Inside' Nome. Angalo introduces the 'Outsiders' to his father Duke Cido de Haberdasheri, leader of the Haberdasheri clan, where they learn that most 'Inside' Nomes do not believe that 'Outside' exists, being contrary to the religion of Arnold Brothers (est 1905), which states that 'The Store' contains the 'All Things Under One Roof'. Ejected from the Duke's presence, the Outsiders wander the underfloor corridors until 'The Thing' is accidentally dropped next to an electrical cable, where it starts to recharge itself. 'The Thing' then powers up and identifies itself as the navigational computer of the Galactic Survey Starship 'Swan'; the ship developed an engine fault many thousands of years ago, and marooned its Nome crew on Earth. When it asks its primary mission, Masklin tells it to keep the Nomes safe and get them home. Grimma, believing Masklin to be surely dead, finally admits her feelings for him but must put them aside to deal with an attempted revolt by Gurder's apprentice, Nisodemus. Nisodemus proposes that they rebuild the store, but is challenged by Grimma. He stands in the road to prove to the Nomes that Arnold Bros. chose him to be leader, but is run over by a car. After attempting to keep the returning humans out by locking the quarry gates, sabotaging a lorry, tying up a security guard and leaving a message asking to be left alone, the Nomes finally make an escape attempt using an old JCB (John Deere in the American release) digger, which Dorcas the engineer discovered in an old shed and subsequently got to work. The digger, which Dorcas calls Jekub (Big John in the American Edition), allows the Nomes to escape en masse when the humans return. After being pursued across fields by police cars, they are rescued by Masklin aboard the recovered starship 'Swan'. Masklin presents Grimma with a bromeliad as a sign that he finally understands her, and they depart Earth for their home. The story is not a sequel but happens simultaneously with the events of Diggers. Masklin, Angalo and Gurder are searching for a plane. They have discovered from a newspaper article that Richard Arnold (or 'Grandson Richard, 39', as the paper refers to him), the grandson of the Arnold Brothers who originally built the store, is planning to fly to Florida for the launch of a new satellite. The Thing states that, if they can get it on board the space shuttle, it will be able to contact the spaceship 'Swan' which has been buried on the moon for thousands of years awaiting instructions. The Thing connects to the airline computers and finds that 'Grandson Richard, 39' is due to board Concorde. They sneak on board, and Gurder is overwhelmed to find that the Concorde is just like the store inside, except that there are fewer places for the Nomes to hide. Masklin discovers where 'Grandson Richard, 39' is sitting, and he suggests hiding in his carry-on luggage. Arriving in Florida, the Nomes help themselves to hotel food while Arnold is in the shower. Coming out unexpectedly, he sees Masklin, but they escape into the surrounding Everglades where they discover another group of Nomes led by Pion. Initially they do not understand each other, however, The Thing is able to translate; the new group of Nomes speak authentic Nomish, the original language of the Nomes. The outside Nomes have learned how to ride wild geese and have established contact with thousands of other Nome tribes across the world. Travelling by goose, they reach the launch pad and place The Thing close enough to the shuttle to copy itself to the satellite on board. The Nomes escape moments before the rocket engine ignites. Having used up its available power, The Thing shuts down. Masklin realises that without The Thing to guide the ship in, it could crash, so he is forced to reveal himself to the humans who take him to a building with a power source. The Thing recharges and informs Masklin that the ship will arrive shortly. While escaping, they encounter Arnold, and Masklin uses The Thing to translate for him, asking Arnold for help. Arnold tells Masklin that his grandfather and great-uncle guessed there were Nomes in the store because they heard noises at night, and helps him escape. Aboard the ship he meets up with Angalo, Gurder and Pion and they plan to return to the quarry to get the others, making a short detour to South America to pick up some frogs in a bromeliad. The Nomes see Concorde flying over the sea to the east, and Masklin realises that it must be flying back to England. They arrive back at the quarry in time to see the Store Nomes careering around a nearby field on Jekub, pursued by a police car and rescues them (as told in Diggers). Masklin presents Grimma with the bromeliad, and they reconcile. All the quarry Nomes climb onboard except for Gurder, who will stay behind on Earth with The Thing to find and tell all other earthbound Nomes about the 'Swan'. They depart for home, promising to return one day and collect Gurder and all the other Nomes still left on Earth. Masklin – A member of the Outside Nomes, Masklin is brave and adventurous. The Thing – A small, sentient computer. A part of 'The Ship'. Torrit – The elderly leader of the Outside Nomes, tasked with keeping The Thing safe. His recent death is mentioned early on in Diggers. Also called old Torrit. Grimma – A female counterpart to Masklin, something of a feminist. Gurder – A religious store Nome. Later becomes the abbot. Angalo De Haberdasheri – Store nome obsessed with the 'Outside', who welcomes the Outsiders on their arrival in the store. Dorcas del Icatessen – The most scientific of the Nomes. Interested in electricity. Granny Morkie – A fearsome, elderly outside Nome. Also Torrit's wife and a healer, of sorts. Arnold Bros. (est 1905) – The 'founder' of the Store and godlike figure to the Nomes. Shrub —The leader of the Floridian Nomes who knows how to control geese. The Abbot – The leader of the Stationeri. Dies of old age in Truckers and is succeeded by his assistant, Gurder. Duke Cido de Haberdasheri – Angalo's father. The leader of the Haberdasheri. Bargains Galore: a benevolent spirit that the nomes believed in and sometimes prayed to. In one scene, a cleaner was thought to be her. Torrit (also known as "Old Torrit") Is no longer seen in Diggers, but Masklin mentions his death early in Diggers. A stop motion animated series of Truckers was produced in the United Kingdom by Cosgrove Hall. In 2001, DreamWorks (now DreamWorks Animation) acquired the film rights to the trilogy, and announced plans to combine all three books into a single film, to be directed by Andrew Adamson. In late 2008, Danny Boyle was attached to direct Truckers, but the project fell apart as "a victim of this economic crisis." The following year, the Slumdog Millionaire's Oscar-winning screenwriter Simon Beaufoy was hired to work on the project. Plans to move forward with DreamWorks' adaptation resurfaced in 2010 with the announcement that Legend of the Guardians screenwriter John Orloff would pen the script for director Anand Tucker. Tucker was later announced to direct another DWA film Trolls, which was planned to be partially based on a Pratchett novel, before he was replaced by Mike Mitchell. ^ "Words from the Master". The L-Space Web. Retrieved 4 February 2015. ^ "DreamWorks Acquires Film Rights to Terry Pratchett's Bromeliad Trilogy". WriteNews.com. 2 May 2001. Retrieved 23 July 2011. ^ "Pratchett gets the Shrek treatment". BBC News. 24 June 2001. Retrieved 3 May 2015. ^ Edward Douglas, Edward Douglas (10 September 2008). "Exclusive: Danny Boyle Getting Animated?". ComingSoon.net. Retrieved 23 July 2011. ^ Arnold, William (20 November 2008). "Q & A: Director Danny Boyle says he's happy in the 'Slum'". Seattle Post-Intelligencer. Retrieved 23 July 2011. ^ Child, Ben (27 March 2009). "Simon Beaufoy gets on the Truckers bandwagon". The Guardian. Retrieved 23 July 2011. ^ Topel, Fred (24 October 2011). "John Orloff on 'Anonymous'". Crave Online. Retrieved 28 October 2011. ^ DreamWorks Animation (9 September 2012). "New Distributor Twentieth Century Fox Unveils DreamWorks Animation's Release Slate Through 2016". DreamWorks Animation. Retrieved 10 September 2012. ^ Weintraub, Steve 'Frosty' (20 November 2012). "Director Peter Ramsey Talks RISE OF THE GUARDIANS, Roger Deakins, HOW TO TRAIN YOUR DRAGON 2, Working with David Fincher on FIGHT CLUB, and More". Collider.com. Retrieved 31 October 2013. There's an interesting project called, right now it's called Trolls, and it's kind of partially based on Terry Pratchett novel. Anand Tucker, another live action director is directing. ^ "Acclaimed Comedy Director Mike Mitchell And Emmy Award Winning Writer Erica Rivinoja Bring DreamWorks' Trolls to the Big Screen". DreamWorks Animation. 28 May 2013. Archived from the original on 29 June 2013. Retrieved 31 May 2013. This page was last edited on 20 January 2019, at 19:31 (UTC).